Pitt basketball center Peace Ilegomah may be forced to sit out this year because of an NCAA rule limiting the number of years student-athletes can spend in high school. According to Sam Ferry, an assistant coach on the team, the NCAA has a rule that states players miss a year of eligibility if they go to college more than five years after starting high school. Ferry said the athletic department filed a waiver with NCAA about one month ago to reconsider the decision. The NCAA has not gotten back to them about when they will make a decision, he said. As of right now — because Ilegomah spent five years prior to college in the United States and an additional year of high school in Nigeria — the NCAA says Ilegomah is not eligible to play this year and will only have three years of eligibility after sitting out this season. The NCAA is counting his last year in Nigeria as his first year of high school. 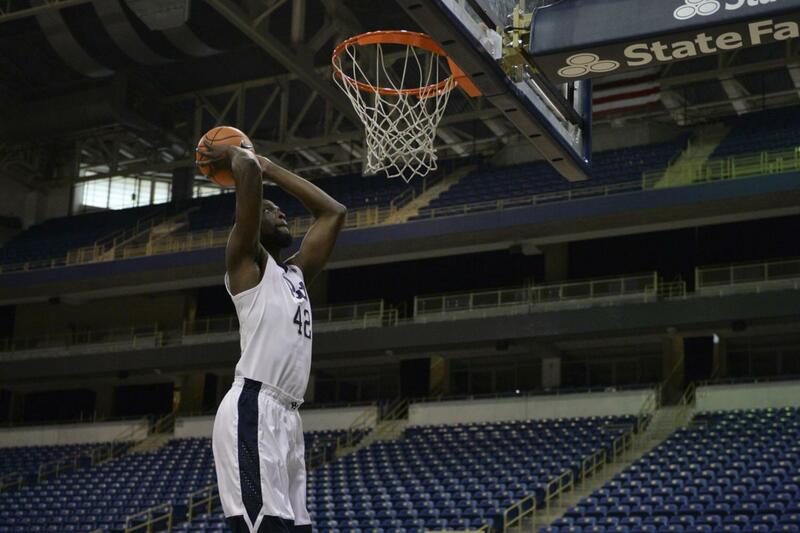 The 6-foot-9 Nigerian center completed ninth grade in his home country before moving to the United States. When he moved to America, he attended a high school in New York, before attending Roselle Catholic High School in New Jersey. According to Roselle Catholic president Thomas Berrios, he was only at the school to complete his junior and senior years. After completing high school in New Jersey, he spent a postgraduate year at Montverde Academy in Florida before Pitt recruited him this season. Ilegomah can play for Pitt after sitting on the bench for a year, but he cannot get that year back — which means he can only play a total of three years for the team as of now, unless the NCAA says otherwise. Ilegomah was one of 13 new players from the 2017 recruiting class. While playing in Florida last year, he averaged 14 points and 12 rebounds per game. Pitt lacked height last season, and Ilegomah — along with first-year center Terrell Brown — was expected to fill that role. Editor’s Note: In a previous version of this story, Pitt athletics said Ilegomah attended Roselle Catholic High School for four years. That information is false. According to school president Thomas Berrios, he only attended Roselle for his junior and senior years. The Pitt News regrets this error.